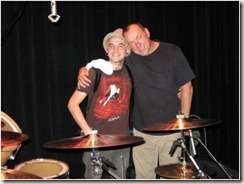 Michael at NeilPeartDrumsticks.com has posted a picture of Neil Peart's Buddy Rich Memorial kit, which Neil will be using on October 18. You can see a high-resolution picture here. I found this photo on Cathy Rich's MySpace. If you live in the New York City area, you should check out this show at the Hammerstein Ballroom. In addition to Neil and Nick, you'll get to see Terry Bozzio, Chad Smith, Tommy Igoe, John Blackwell, and many special guests (like Jeff Berlin playing bass). As someone who wrote to me said, this is a "drummer's dream." Watch the show on The Drum Channel. Let me know if you're attending, as I'll also be there.